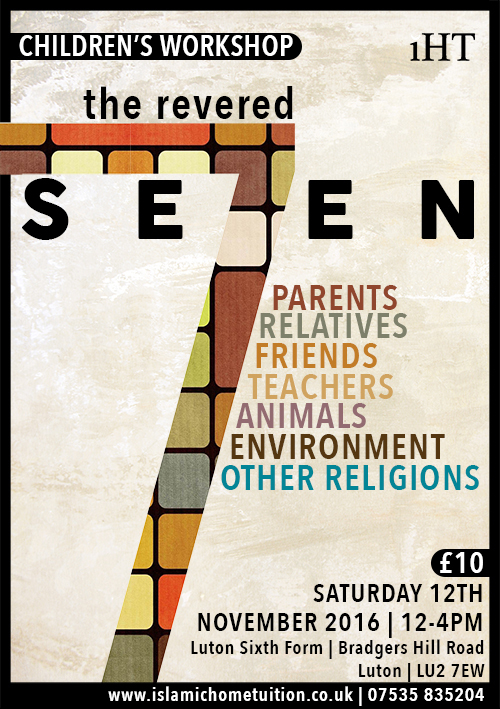 The Revered Seven is a new workshop that has been designed for children. The main purpose behind developing this workshop is to teach children the importance of honouring those who have been revered in Islam by Allah and His Messenger (s). Parents are from amongst the most deserving of being honoured and revered. Therefore this workshop will give additional time to explore the ways in which parents ought to be honoured. Furthermore there will be ample time given to children to discuss how they feel parent-child relationships can become stronger. The desired outcome of this course is for children to recognise the importance of honouring parents and ways in which they can improve their relationships. Teachers are given an extremely high rank in Islam and are again from amongst the most deserving of being honoured. Traditions of the pious predecessors inform us that the rank of teachers is the same as parents as they are the ones who assume responsibility for the betterment of your spiritual, otherworldly life where as parents take care of your needs in this world. The intention for this segment of the course is to outline the ways in which a teacher influences a student and the different way in which we can revere teachers. The importance of maintaining ties with immediate family and relatives in general is massively emphasised in Islam. The severing of these ties has been made prohibited and more often than not, the severing of ties comes through lack of honouring and understanding one another. Children will learn methods of how to treat siblings and more distant relatives too. The aim will be to teach children how to maintain ties with family members and ways to make amends for any relationships that do go through difficult periods. Reverence of friends is demonstrated to us through the life of the Messenger (s) time and time again. This segment will make clear exactly how essential it is to have righteous company and friends that encourage you to be an individual of goodness. We recognise the value of good friendship and the difference it can make. Therefore the primary focus of the ‘friends’ segment will be to explore some of the ways that children can select their friends and ensure that the company they keep is good. The treatment of the environment has become a huge contemporary issue. It is vital that we teach our children how Allah and His Messenger (s) honoured the environment hundreds of years ago and the principles that have been laid down for us to learn and comprehend. Children will be given time to discuss how to revere the environment in a way that is effective and lasting. The outcome of this segment of the course must be that children learn how to honour all of the different aspects of the environment, from personal space and possessions to public arenas and the outside world at large. Short video on the importance of protecting the environment. Tolerance is a key aspect in this religion and ought to be taught more. Reverence of other religions means being dutiful and respectful to those individuals that take them as their way of life. Children will meet many people from all walks of life and it is only beneficial that they understand the ways in which to honour others. The hope is that the children will learn some very fundamental aspects of other religions they regularly encounter and study different methods of engage with them. Honouring animals is emphasised in Islam and has been highlighted by the Messenger (s) on numerous occasions. We take much benefit from animals and therefore children have to be taught the ways in which to revere them. The intention is that children will study some of the chief principle of animal rights and see how they fit in with Islamic values.